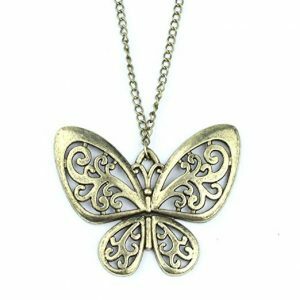 Butterfly Necklace Only $5.60 On Amazon! This is such a cute little costume jewelry necklace to grab. I know my little one would love wearing this and it would match most outfits! Vintage style hollow butterfly sweater chain necklace . Made of alloy metal,durable and non-breakable. The butterfly size about 5 x 5.5cm(1.9″ x 2.1″),the chain total length 26 inches. Wear for a variety of dress,sweater,overcoat,jacket etc.